The Socialist Party has launched a financial appeal to enable it to stand candidates in the next general election and put forward an alternative to the programme of massive job cuts in public services and privatisation being promised by Labour, Tories and the Lib Dems, writes Ken Douglas. STOCK MARKETS and the world financial system have been rocked by the request by investment corporation 'Dubai World', the wholly-owned subsidiary of the Gulf state of Dubai, for a six month moratorium on the repayment of $3.5 billion of loans, writes Kevin Parslow. Chilcot inquiry: Put the warmongers on trial! PUBLIC ANGER at the blatant spin and lies used to justify the invasion and occupation of Iraq by those with blood on their hands - messrs Blair and Brown - has resulted in the Chilcot Inquiry, writes Matt Dobson. Youth march for jobs: "A fantastic experience"
Youth Fight for Jobs (YFJ) will doubtless earn a reputation for putting on the most lively, vibrant and colourful demonstrations in Britain, writes Sean Figg, YFJ national organiser. EVEN PRIME minister Gordon Brown has condemned Tory Nottinghamshire county council's savage plans to impose over £31 million of cuts, cutting 450 jobs this financial year alone and attacking staff terms and conditions and council services, writes Onay Kasab, secretary, Greenwich Unison branch (personal capacity). ON 24 NOVEMBER over 250,000 public service workers in the Irish Republic took part in a one-day strike, writes Michael O'Brien, Socialist Party (CWI Ireland). Four recent strikes in Yorkshire have pushed back the employers' agenda of cuts, with important lessons for all trade unionists, writes Alistair Tice. In the last few weeks the industrial dispute between British Airways cabin crew and management has become increasingly bitter, writes Neil Cafferky. Despite six days of strike action by Axiom Rail workers in Stoke, management have refused to carry out any meaningful negotiations over the pay increase workers are asking for, writes Andy Bentley. ON 3 August 2009, the Liverpool Echo reported that Liverpool city council faces a budget 'black hole' of over £90 million in the next five years, writes Tony Aitman, Tony Mulhearn and Dave Walsh. THE LATEST report on safety standards in our hospitals lays bare some shocking examples of safety failures in some NHS hospital trusts. The Hospital Guide, compiled by a joint private/public body known as "Dr Foster", highlights 12 trusts that underperform on patient safety measures, writes Jane James. Weeks before the mid-December UN summit in Copenhagen was due to convene, Barack Obama killed any lingering hopes that it would deliver a new treaty on global warming to replace the one agreed at Kyoto in 1997. PETE DICKENSON looks at the sticking points that led to failure and the prospects for the 'political framework' that now appears to be the likely outcome in Copenhagen. While the capitalist world leaders argue about figures in Copenhagen, climate change is already affecting billions of lives across the world, writes Tom Baldwin. NOTTINGHAMSHIRE STOP the BNP (NSBNP) has organised a Unity Rally in Nottingham on 5 December against a planned 'protest' in the city by the nationalist, racist English Defence League (EDL), Nottingham Socialist Party members write. Where the EDL has reared its head in other cities, it has been opposed by local community activists, trade unionists and anti-racist campaigners. 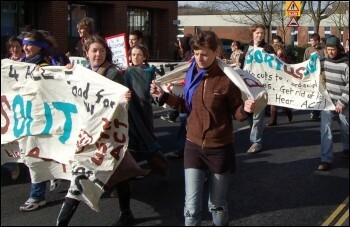 Mass Student Protest Against Cuts at Sussex University! No privatisation, fight the big business agenda: AFTER MARTIN Stanley, the industry regulator's recent vicious attacks on postal workers, it is easy to see why Royal Mail management felt confident to provoke further strike action after the 24-hour official strike at Watford, a London postal worker writes. YOUTH AGAINST Racism in Europe (YRE) supporters went into the Glodwick area of Oldham on Sunday to show our support for the community but also to find out the truth about what was happening, writes Christian Bunke. THE ELECTORAL commission, a new quango set up this year to regulate political parties and their electoral activity, has reported on the huge amount of money the unions are giving to New Labour's election fund, writes In the six weeks between 16 February to the end of March, the first 'reporting period' under the new. John McDonell, a UNISON-backed MP, is backing the call for an independent inquiry into allegations made in court against senior UNISON full time officials. ""I am horrified, shocked and quite frankly outraged, especially when I heard of the detail of the allegations against the individuals concerned... "
The strike action being taken by Axiom Rail workers in Stoke for a pay increase has rocked the management, writes Andy Bentley, Stoke Socialist Party. 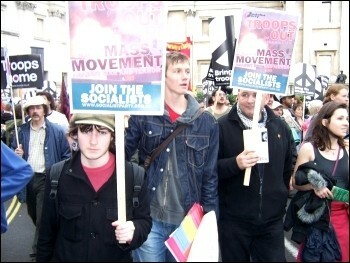 Battling the far right in Nottingham: Hundreds of mainly young, local people turned out in Nottingham city centre on 5 December to oppose the racist 'English Defence League' (EDL), writes Nottingham Socialist Party members. SOLIDARITY IS urgently needed for striking South African mineworkers at a plat-inum mine in Rustenburg whose dispute has become extremely bitter, writes Weissman Hamilton and Mametlwe Sebei, Democratic Socialist Movement, (DSM, CWI South Africa). THE SCOTTISH National Party (SNP) government in Scotland marked St Andrew's day - 30 November - by presenting a 'white paper' which sets out its case for a fully independent Scotland, writes Philip Stott, International Socialists, CWI Scotland. 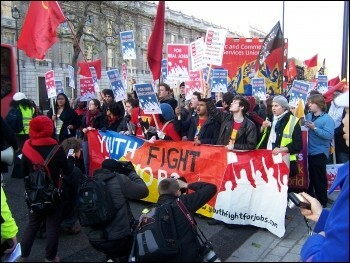 While state funding for higher education is being slashed, a Demos think tank report suggests that students should be forced to 'earn' the money coming from the state towards their education by doing community service, writes Sean Figg, Youth Fight for Jobs national organiser. 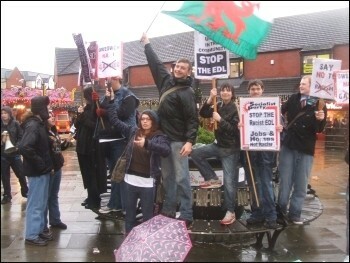 A dispute over workplace bullying between Glyndwr University (Wrexham) administration and University and College Union (UCU) members escalated on Monday 7 December, when management attempted to get security and police to evict Glyndwr UCU organiser Hamish Murphy from his office, writes Edmund Schluessel. The Socialist Party is appealing to all its supporters and readers of The Socialist to make a donation this Christmas to support the party's fight to build a socialist alternative, writes Ken Douglas, Socialist Party national treasurer. THE OCCUPATION of Afghanistan has lasted eight years; it has cost thousands of lives and billions of dollars, writes Ken Douglas. 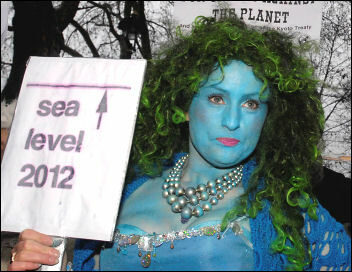 Paying the price of global warming: TENS OF thousands of people marched through central London to the Houses of Parliament on Saturday 5 December to demand action from the Labour government, and the world's leaders, ahead of the Copenhagen summit on climate change, writes Dave Carr. 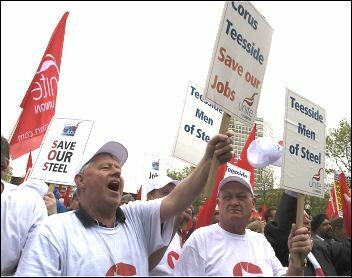 Workers in Teesside are shocked and outraged at the news that the Corus steel plant in Redcar is to close by the end of January, with the loss of 1,700 jobs, writes Ed Hamilton, Teesside Socialist Party. 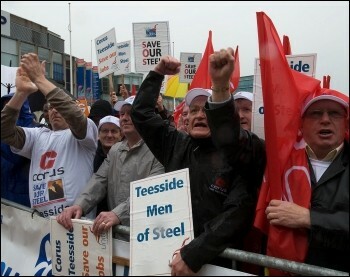 On 4 December it was announced that DB Regio is the preferred bidder, over the in-house bid, to operate the Tyne and Wear Metro from April next year, writes Norman Hall, Keep Metro Public (KMP) steering committee and Socialist Party member and Stan Herschel, RMT regional organiser and Socialist Party Member. An emergency senate meeting on 3 December, called by Sussex University management to discuss savage cuts, was picketed by over 400 students, writes Sussex University Socialist Students. Pre budget report offers no solution to threat of "a lost generation of youth unemployment", writes Press release from Youth Fight for Jobs. Westgarth Social Club, 99 Southfield Road, Middlesbrough, TS1 3EZ. 150 years since the publication of On the Origin of Species: Charles Darwin's theory of 'natural selection' changed the way that we look at ourselves. It contradicted the idea of an outside 'intelligent designer', so it met a reaction from the religious establishment. In this feature, ROY FARRAR marks this year's bicentenary of Darwin's birth and the 150th anniversary of the publication of his book On the Origin of Species by summarising some of Darwin's ideas and their significance. ON 3 December, workers in the NASUWT and NUT teachers' unions went on strike at Weston Favell School in Northampton, writes Lee Dunkley, Northampton Socialist Party. Sean Figg, Youth Fight for Jobs national organiser, said: "Unemployment for youth between 16-24 years has risen to 952,000, capping off a year of rising youth unemployment levels. 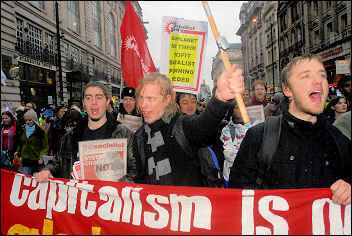 As bankers enjoy their tax-payer funded bonuses, a generation is thrown onto the scrap heap. Where is the world economy going? Socialist Party statement: On the decision of one judge and at the behest of British Airways bosses, the workers of Britain and their trade unions have been told that the democratic right to strike has been cancelled.